Recorded LIVE in Lansing and Ann Arbor Michigan, summer 2017 with all-star Michigan musicians. A real "live", energetic, creative,and fun sound! I hope you enjoy this recording taken from two concerts, during August of 2017. Moriarty's Pub in Lansing, Michigan has a regular Tuesday night Jazz series,"Jazz Tuesdays", and it has been going strong under the leadership of drummer Jeff Shoup. Tracks 4 and 5 were recorded in concert at Kerrytown Concert House in Ann Arbor Michigan with seller musicians: Paul Keller-bass, Rick Roe-piano and Sean Dobbins -drums. A familiar jazz venue to Ann Arbor and Detroit residents, Kerrytown Concert House tracks come from what was a tremendously fun night! 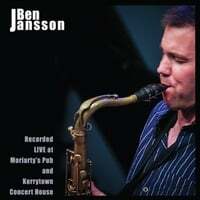 Saxophonist Ben Jansson has been living in Sapporo, Japan for the last 4 years. During the last few years he has toured through Japan, played concerts in USA and Canada and recorded 2 recent albums to add to his 2 already out as a leader. Jansson continues to play music which is based on the legacy of bebop and one of the founders of the tenor sax: Lester Young. While sticking to tradition out of love, Jansson is a modern voice projecting swing, funkiness and all types of modern harmonies in the here and now! Enjoy this straight-ahead album.